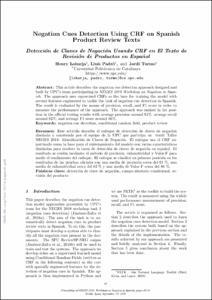 This article describes the negation cue detection approach designed and built by UPC's team participating in NEGES 2018 Workshop on Negation in Spanish. The approach uses supervised CRFs as the base for training the model with several features engineered to tackle the task of negation cue detection in Spanish. The result is evaluated by the means of precision, recall, and F1 score in order to measure the performance of the approach. The approach was ranked in 1st position in the official testing results with average precision around 91%, average recall around 82%, and average F1 score around 86%. © 2018 CEUR-WS. All rights reserved. Loharja, H., Padro, L., Turmo, J. Negation cues detection using CRF on Spanish product review texts. A: Taller de NEGación en ESpañol. "NEGES 2018: Workshop on Negation in Spanish: Seville, Spain: September 19-21, 2018: proceedings book". 2018, p. 49-54.